Roshan Giri, the executive GTA Sabha member in charge of education, today claimed that education minister Partha Chatterjee had today told a GTA delegation that the state government was planning to regularise the jobs of voluntary teachers in the hills and the document verification drive undertaken by the School Service Commission was a step in that direction. 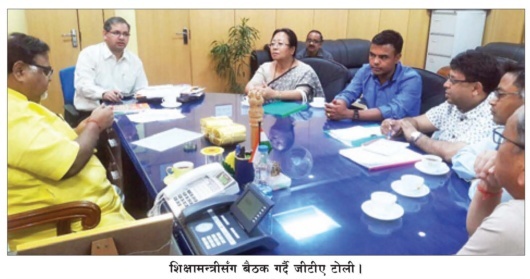 The SSC had conducted the document verification on the premises of the district inspector of school's office in Siliguri for three days from February 9. Giri, who is also the general secretary of the Gorkha Janmukti Morcha, had alleged that voluntary teachers allegiant to the party had not been called for the verification process. After a GTA delegation met Chatterjee in Calcutta today, Giri said over the phone: "We have been told that the government wants to regularise the jobs of voluntary teachers. Today, we submitted a list of 630 voluntary teachers to the education department. We were told that the documents of 467 teachers were scrutinised in Siliguri." Earlier, a communication had suggested that the verification was done for revision of wage. The GTA delegation demanded that the genuineness of the candidate be verified with the "register of appointment" that the GTA had submitted to the state government on July 9, 2014. "The register of appointment was submitted by the schools. The list has 503 teachers. We expect the state government to follow this list for the regularisation," said Giri. Asked about the difference in the number of voluntary teachers in the "register of appointment" and the list submitted by the GTA today, Giri said: "In the last few years, 47 junior high schools (till Class VIII) have been upgraded to high schools, while 29 high schools were upgraded to higher secondary schools. So, the number has gone up," said Giri.